Need more information about booking Home 6675758 ? This 4 bedroom villa is located on a cliff-top with amazing panoramic views o the Mediterranean Sea as well as the Akamas coastline.Upon entering this villa you will find the spacious open plan living/dining and kitchen area. The villa is modernly furnished and the fully equipped kitchen with dark wood cabinets and stainless steel appliances creates a beautiful atmosphere. The dining area has a dining table and seating for up to 8 guests. A door from the kitchen leads the way to the outdoor area and swimming pool.On the ground floor you will also find the first bedroom of this villa; A double bedroom with an adjacent shower room with a corner power shower with massage body jets and lighting. Underneath the stairs you will find a separate cupboard housing the washing machine.Moving up to the first floor of this villa you will find the remaining 3 bedrooms. The master bedroom is a double bedroom with an en suite shower room and direct access to a large balcony with table and chairs, where you can enjoy an evening drink while admiring the stunning sea views.A further double bedroom shares access to this large balcony, whereas the remaining double bedroom has its own small private balcony. A family bathroom is also to be found on the first floor.Moving to the outdoor area you will find an outdoor dining table and chairs underneath a pergola which combined with the barbecue gives you the opportunity to enjoy al fresco dining.The large private swimming pool is surrounded by sun beds an umbrellas as well as a large day bed. From the area you can enjoy the uninterrupted views of the coastline and the Mediterranean Sea.To the front of the villa you will find covered parking for 1 car and plenty of uncovered parking in the long driveway. This Villa has 4 bedrooms, 3 bathrooms and sleeps 8. It’s been listed on Holiday Lettings since 01 Jul 2015. 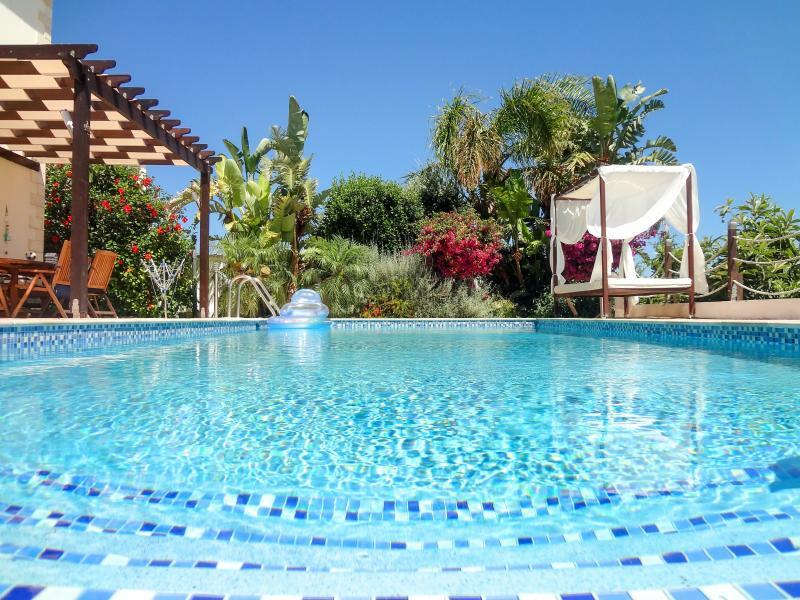 Located in Paphos District, the average weekly rate varies from £908 to £1513. The Manager has a response rate of 90% and the property’s calendar was last updated on 08 Apr 2019.